The spa pool at Montage Laguna Beach is certain to ease worries. No bags to pack, security lines to clear, or out-of-office messages to set. When it’s time to rejuvenate, Orange County residents need only spend a day at the world-class spas and resorts in our backyard. Turn off your phone and ignore the world while you reset your mind and invigorate your body. Whether you want a day of pampering, a day of fitness, or a simple treatment and a serene meal with a friend, you’ll find it along our coastline. As out-of-towners depart when summer ends, take advantage of the quiet weekdays—and potential discounts—at any of these spas. It’s hard to imagine a resort better suited to help you capture the benefits of the ocean. From the yoga studio with a wall of retractable windows facing the Pacific to the one-hour Thalassic Beach Walk—where you will learn about how coastal air can cleanse your lungs and relax your mind—to the Marine Wrap or Seaside Renewal body treatments, the water and its soothing properties are at the forefront of this five-star spa. Take advantage of the Elements of Wellness Signature Services ($340 to $455), where master therapists will personalize your treatments. These pros inspire you to treat yourself better with their heartfelt and infectious care. The offerings include massages, aromatherapy, wraps, scrubs, therapeutic baths, and body brushing to improve the lymphatic system. Be sure to leave time to luxuriate in the outdoor Art of Spa area, which includes eucalyptus steam rooms, redwood saunas, a whirlpool with a small waterfall, a cold dip plunge where the water is 52 degrees, and outdoor showers that evoke the tropics. Top it off with lunch from the Be Well by Kelly menu at Mosaic Bar & Grille featuring delicious, healthy options ($16 to $24). 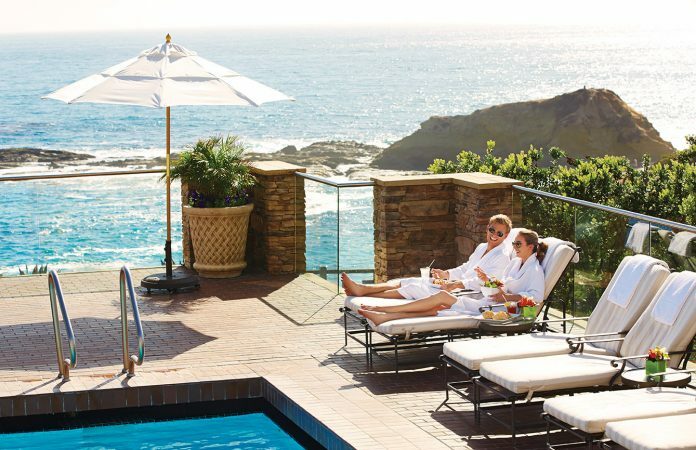 Find serenity after a treatment at The Resort at Pelican Hill. Give yourself over to the staff here, each of whom is supremely welcoming and attentive without being cloying. Worries fall away as you step into the vast saltwater whirlpool, herbal steam room, or sauna in the Acqua Colonnades. Bring workout shoes to participate in the fitness classes including yoga or strength training, or to partake in the daily guided beach walk at Crystal Cove. Any treatment includes access to the five-star spa, so whether you only want a manicure ($50) or you seek the rejuvenating powers of the scrub-wrap-massage combination that is the 80-minute Coastal Renewal ($265), you’ll also enjoy the full amenities. Natura’s Diamond Experience facial ($325) delivers 80 minutes of relaxation and the glowing, youthful skin seen only in makeup ads. For VIP treatment, consider the Day of Wellness custom package ($970): Start with a 7 a.m. workout, receive treatments of your choice, have a healthy meal in the private Spa Suite, meditate, sip Prosecco, and take in a private happiness workshop tailored to help you feel more empowered and balanced. Fitness fanatics, this retreat is for you. The sprawling facility here offers up to 55 classes a week with captivating options such as floating meditation (in silks suspended from the ceiling), cardio drumming, and yoga on a raft in the pool. 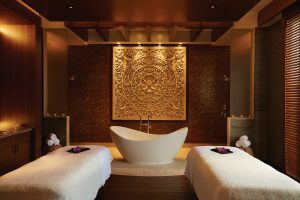 Locals can join the annual membership program, get a day pass for $50, or book a spa treatment and try any of the Signature Miraval classes as part of your access. The Diamond Brightening Facial ($260 or $275) targets imperfections to leave you refreshed and glowing. Or go all out with a trio of signature experiences (starting at $370). The spa has a quiet room, whirlpool, herb-infused steam room, and sauna, plus everything you need to get ready after your day of rejuvenation. There’s a Deborah Lippmann nail salon and a DryBar outpost, so you can continue to relax and leave specifics to a pro. The Balinese vibe extends to the couples room at Aarna Spain in Huntington Beach. Inspired by Bali, the mood here is set the minute you disappear behind the beautifully crafted Balinese door. Try the Ocean Devotion 80-minute massage ($279), which uses a healing technique where the therapist’s fingers feel like tiny mallets working deep into your muscles. This percussive approach, followed by soothing hot stones and exfoliation, delivers hurts-so-good results. 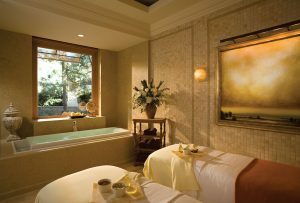 If you like spa à deux, the couples room is large and luxurious, with a therapeutic bath that can be included in your treatment (massages start at $339 per couple). There’s a private spa garden, a saltwater whirlpool, and a eucalyptus steam room. Even the showers are special, with 13 nozzles for head-to-toe replenishment.